In my opinion, 19 condos is still too many for this lot. Below are new condo developments that were built on West 2nd between E & F Streets. 360 West 2nd is a 9,460 Sq. Ft. Lot. I'm having a difficult time understanding why it should be approved for 19 units when 3 out of the 4 developments above were approved for approximately 1.5 Units per 1000 Sq. Ft. of the lot size. At 19 units, that would be approximately 2 units per 1000 Sq. Ft. of lot. I believe this lot should be approved for 15 condos and 25 parking spaces. Whether that happens or not, we'll see. 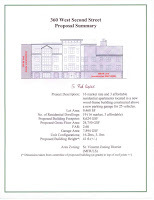 If you would like to send comments to the BRA(Boston Redevelopment Authority), please email Erico Lopez at [email protected] The public comment period ends July 8, 2011, and if the BRA receives enough negative remarks, they may force the developer to address the neighborhoods concerns.